The Portsmouth Poet Laureate Program chose 12 finalists in its “Voices and Vision” project conceived by Portsmouth Poet Laureate John Perrault to bring together poets and visual artists to create works of public art which would then be acquired by businesses and municipal organizations and permanently displayed in the Portsmouth area. My photographer-husband, Charter Weeks, and I were among the artists chosen. 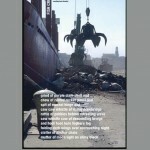 Our piece combines images of the vessels working the city’s port with poems about the river and ocean’s working birds. The full-sized original–designed as a kind of oversized book–can be seen at the Portsmouth, NH Public Library.